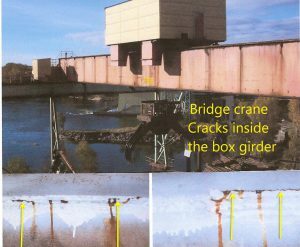 g-ACK AB | CRANES- BRIDGE AND GANTRY AND RUNWAY GIRDERS. 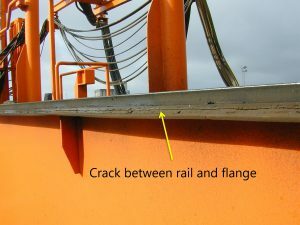 WELD BETWEEN WEB, FLANGE AND RAIL. 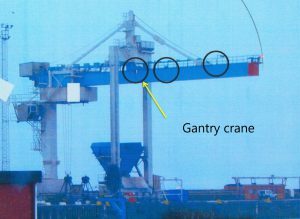 CRANES- BRIDGE AND GANTRY AND RUNWAY GIRDERS. 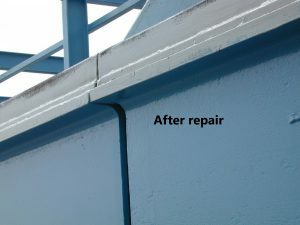 WELD BETWEEN WEB, FLANGE AND RAIL. 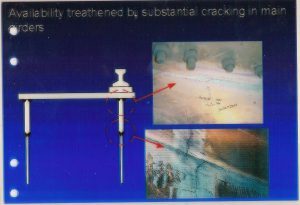 Low standard demands, manufacturing faults combined with high wheel pressure and many cycles. 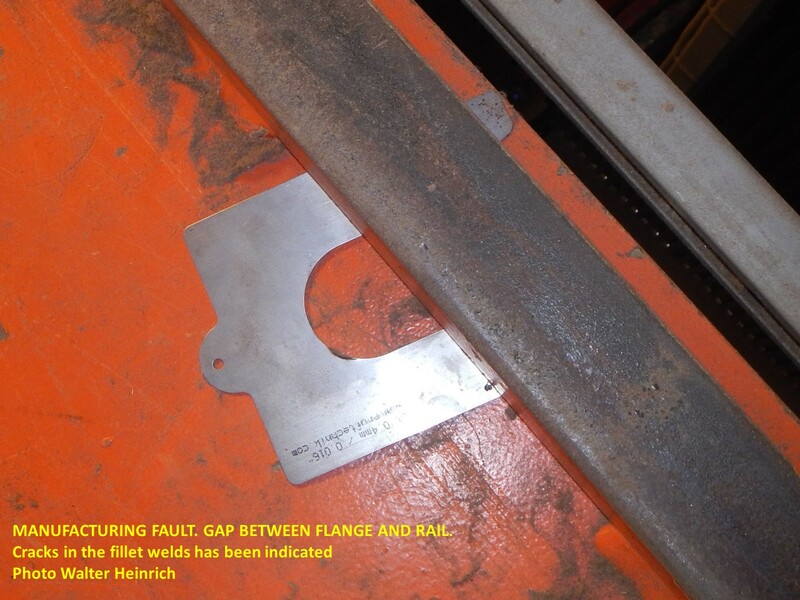 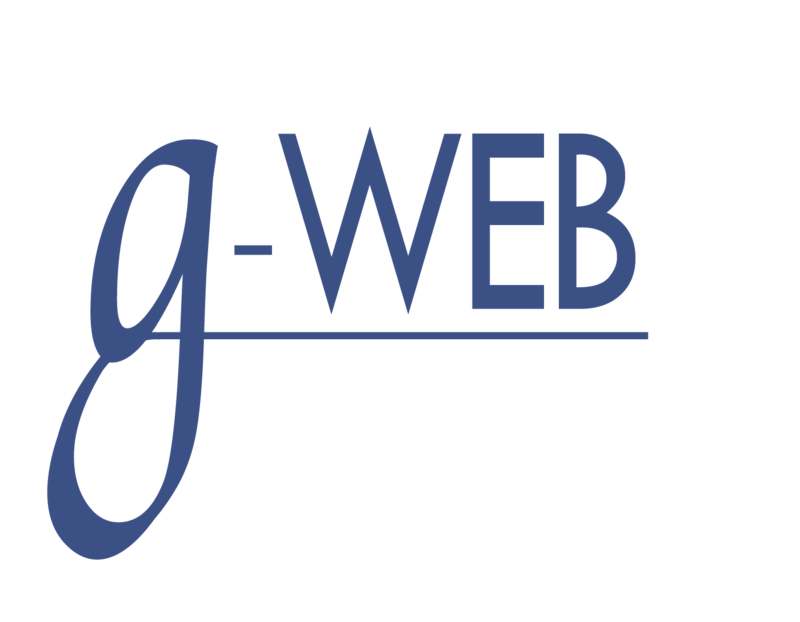 The welding between the flange and web has deformed the flange and resulted in residual tensions. 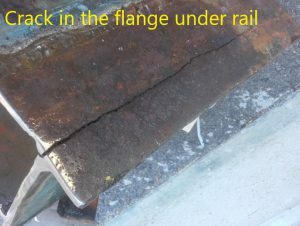 The flange deformation has also resulted in a gap between the flange and rail. 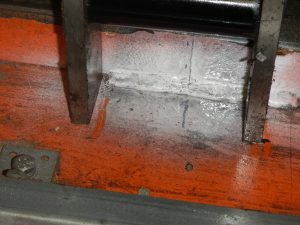 Local forces from the wheel pressures go through the fillet welds and via the flange down to the web. 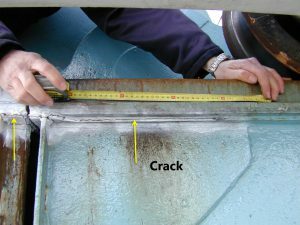 The cracks who occurs in the fillet welds heels and in the web are hidden and very difficult to predict and find, but have a devastating impact on the girders strength. 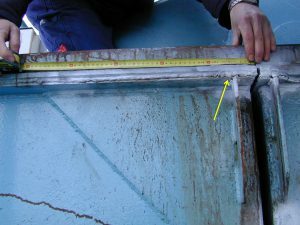 When building the girder, the welds must have the right quality and the flange must be perfectly straight under the rail. 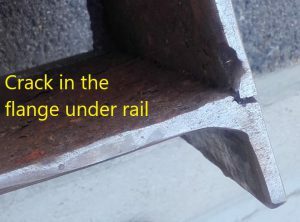 The rail must be pressed hard against the flange and no gap between rail and flange after welding the rail can be allowed due to my opinion. 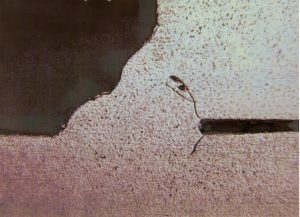 The tolerances in EN 1090-2 D.2.19 No 1 for Class 2 is now +- 1 mm but should due to my opinion be 0 mm. 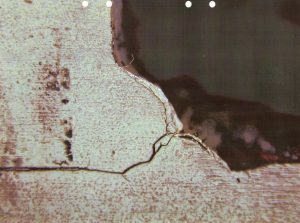 EN 13001-3-1 Annex C C.4 and D.3. 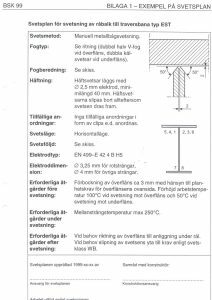 This is a page from a previous handbook from the “Swedish BOVERKET” (before the EUROCODES). 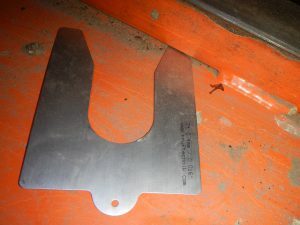 3 mm before welding to the web because the rail must lay on a plane surface”. My comment is “and the rail must have hard pressure on the webb during the welding of the fillet welds”. 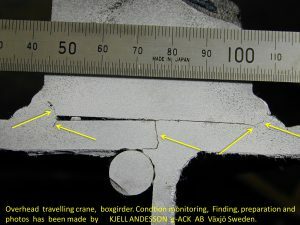 I have today no comments on how the impact from the built in tensions from the combined bending and weld heat in the flange is acting on the fatigue problem. A great number of crane and runway girders have been and are built today as shown here without any information about a plane flange. 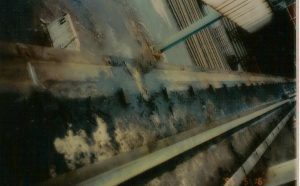 Runway. 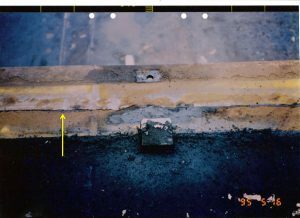 The rail is moved so that the crack in the upper flange is visible. 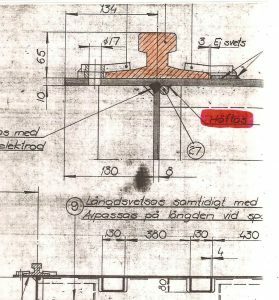 Smarta funktioner till hjälp för operatören – men var försiktig! 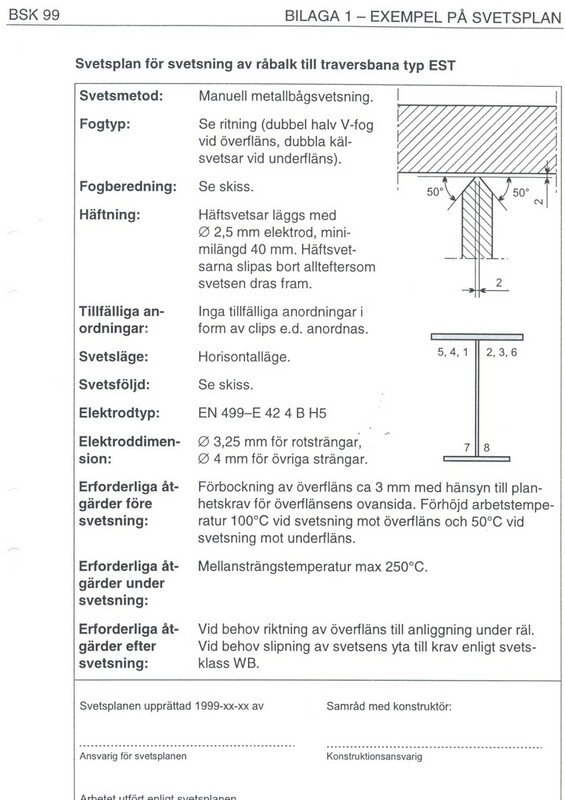 Den årliga sommaraktiviteten med personalen blev kundträff!